Parsley is a widely popular herb characterized by its fragrant and slightly bitter taste, and is often used as a decorative garnish in many dishes. The two most popular types of parsley are curly parsley and Italian flat leaf parsley. The herb resembles coriander, especially the flat leaf variety. Parsley is native to the Mediterranean region of Southern Europe and has been cultivated for more than 2,000 years. Parsley is found to contain a powerful flavonoid called myricetin that helps prevent the onset of skin cancer. The high chlorophyll content in parsley is also touted to mitigate the carcinogenic effects of heterocyclic amines — compounds generated by grilling foods at high heat. Aside from this, the herb is touted to contain a natural chemical called apigenin, which has been found to reduce tumor size in an aggressive form of breast cancer. Parsley is also known to reduce the risk of developing diabetes. 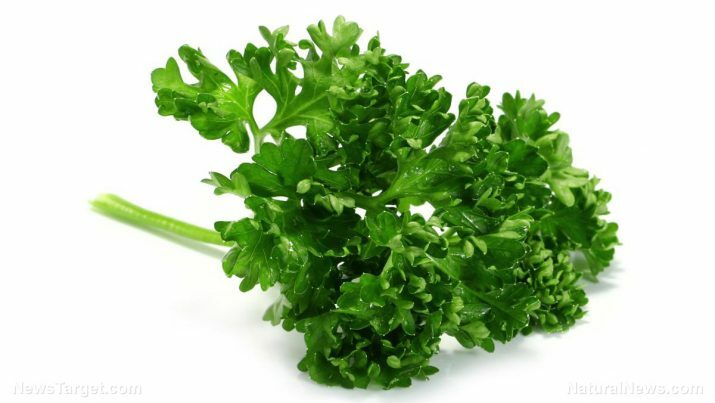 The myricetin in parsley is shown to reduce blood sugar levels and curb insulin resistance. Likewise, the compound is known to contain anti-inflammatory effects and reduce excess fat from the blood. The herb’s anti-inflammatory effects are touted to relieve insect bites, bruises and toothaches. Parsley is found to treat rough skin as well. Additionally, the herb’s anti-inflammatory effects are known to reduce internal inflammation. On the other hand, parsley’s anti-hepatotoxicity properties are found to cleanse the liver and promote its overall health. Aside from this, the herb’s rich vitamin C and beta-carotene supply facilitate uric acid removal. This in turn alleviates rheumatoid arthritis. Moreover, parsley is notably high in calcium that promotes bone health. The herb’s abundant folic acid supply is also found to fortify the bones, as it breaks down homocysteine. Homocysteine is an amino acid that is responsible for calcium depletion in the bones. Likewise, the high vitamin K content in parsley boosts the body’s calcium absorption and reduces urinary excretion of the essential mineral. The herb is also known for its diuretic effects that rid the body of various diseases such as kidney stones, urinary tract infections and gallbladder stones. Parsley is found to treat edema as well. Furthermore, the high nutrient content in parsley is known to fortify the body’s immune system. Aside from this, the herb’s rich vitamin A supply works directly on white blood cells, thus bolstering their potency. The chlorophyll in parsley is also touted to have anti-fungal properties. The herb’s abundant antioxidant and nutrient supply is particularly beneficial to the body’s immune and digestive systems. Parsley is also notable beneficial to both the skeletal and the urinary systems. Parsley is best known for being a pasta staple, especially in pesto. Likewise, parsley can be incorporated in dips, sauces and even baked desserts. The herb can also be used in soups and salads. An article published on the Huffington Post website has curated sumptuous parsley recipes across the web. Parsley destroys 86 percent of lung cancer cells and is effective in killing breast, ovarian, pancreatic, prostate and colon cancers! Parsley prevents cancer, diabetes, and inflammatory diseases. Parsley staves off kidney stones, urinary tract infections, and gallbladder stones. Parsley keeps osteoporosis, rheumatoid arthritis, and edema at bay. Parsley benefits the immune, urinary, skeletal and digestive systems.